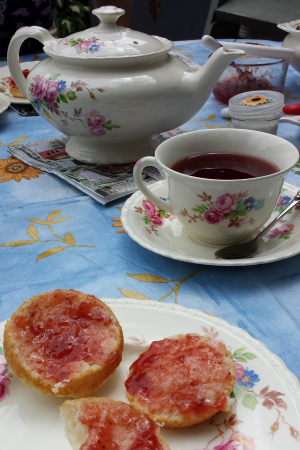 In the middle of this month, my friend JK had a tea party at her place. Unfortunately (or maybe fortunately, depending on how you look at it), I was the only one able to attend. Despite me being the only guest, we decided to stick with JK’s original dress code, which was a dress/skirt or nice pants, and a hat or fascinator. It was so much fun to bust out of my usual at-home work attire of leggings and a tank top and my shopping 'uniform' of jeans and a tee. 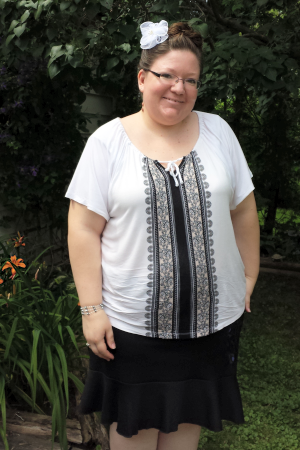 I wracked my brain, and as far as I can figure, the last time I dressed up was when I was in Europe two years ago. We sat outside in JK's beautiful garden (until it started to storm) and had tea and scones while listening to Ed Sheeran (a mutual fave). JK went all out with pretty china and decorations. 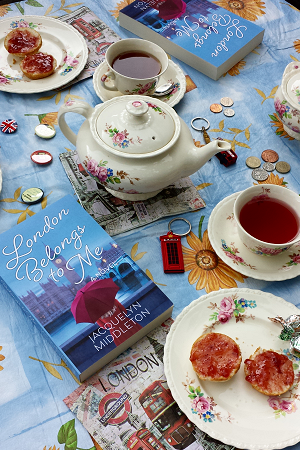 Since we've both been lucky enough to win signed copies of Jacquelyn Middleton’s book London Belongs to Me, and since the party had a British theme, we did a fun little photo shoot with her book for Instagram. When the storm came and we had to take things inside, we watched Austenland (in keeping with our British theme). I hadn’t seen it, although it’s been in my Netflix queue for ages. It was pretty ridiculous and silly, but it was also hilarious and swoony and OMG JJ FEILD. I loved it. It was a great afternoon. 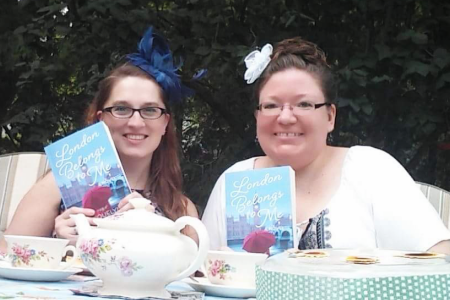 I’ve always wanted to go to a fancy tea party, and while it was just the two of us, it was a blast. Want to see more? Check out my personal Instagram here, my bookstagram account here, and JK’s Instagram here. 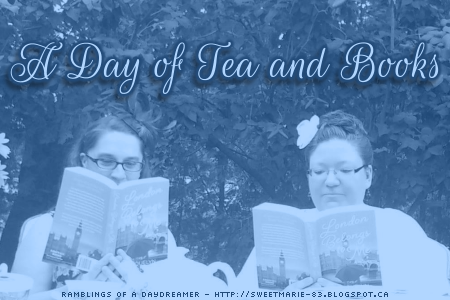 Have you ever been to a fancy tea party or high tea in a restaurant? I wanted to do high tea when I was in London, but between the price (average of $50 Canadian with the ridiculous exchange rate at the time *cringe*) and the lack of time, we didn’t make it. Next time for sure! My dream is to have tea at either Kensington Palace or the Ritz. Might as well dream big, right? It looks like you guys had so much fun!!! I love that she has a fancy tea set! We did! :-) I love the fancy tea set too. My mum has a ton of fancy tea cups and saucers, and I love admiring them (and even occasionally using them). That is so awesome! 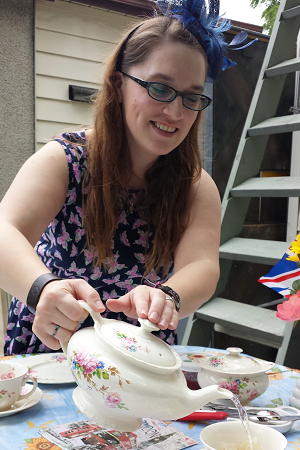 One of my most favorite things I ever did with my alumnae association was high tea. I didn't think it would be for me, but I adored it. Adding books just makes it perfect. How fun! I'm sure a lot of people think it's not for them - too fussy or fancy or whatever - and then end up enjoying it. Whenever I see people on Instagram having high tea, I always drool over all the goodies! I went to my first tea in DC this past winter. It had been raining outside and my feet were killing me from my chosen footwear for the day. It was so calming entering the small hotel, relaxing with my husband, and enjoying tea, scones, sandwiches, desserts, and prosecco. Yum. :) And since I enjoyed it so much, I can't imagine a better way to have a book meeting. Maybe you'll get to have tea next time you are in England?